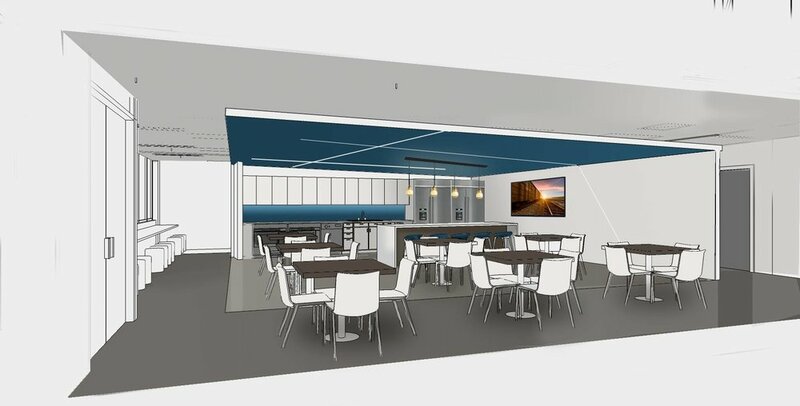 Suzanne Zahr and her design team are excited to announce their newest project: redesigning Meteorcomm’s 40,000 square foot office space. Meteorcomm is the leader in wireless communication technology for the railway industry. Founded in 1975 as a group of wireless communication consultants, Meteorcomm is an effective and reliable alternative to satellite communications through a technology that uses ionized meteor trails to propagate radio signals. In the 1990s, Meteorcomm patented Extended Line of Sight as a method of communicating real-time data up to 50 miles. By the 2000s, this technology was adapted to the rail industry, and by 2010, the four largest US railroads adopted Meteorcomm’s technology as the foundation for a nationwide Positive Train Control solution for train communication. Their technology is continuing to develop, making them pioneers in the development of innovative wireless communication technology. With this same pioneer spirit of expansion, Meteorcomm started in a two-story office building in Renton, WA, but as their company grew, they took over the entire building and became the only tenants. However, this meant that the building was still constructed for multiple tenants – with many corridors and separated rooms, the building did not use space efficiently for a single tenant. After exploring other options in the market and performing real estate due diligence, Meteorcomm made the decision to stay in their original location. But to accommodate their need for efficient space, they decided to do a remodel and received a budget to use over the life of their lease. They brought in Suzanne Zahr and her team to figure out the details, and they quickly realized that the best course of action would be to wipe the slate clean and design a whole new layout. This massive overhaul will remodel the space so everything can flow more efficiently and growth can be managed. As a highly collaborative and innovative environment, Meteorcomm wants to foster a space where people can work together and individually. The new design will include specialized rooms for training, team rooms, and laboratory environments. Because many of Meteorcomm’s employees told us that they find their work meaningful and interesting, it was clear that this excitement for innovation needed to be embedded in the design plan. A natural byproduct of this new design is an increase in productivity, directly impacting Meteorcomm's bottom line. To help represent the Meteorcomm brand more outwardly, the design team played off of themes that related directly to the company’s mission. Inspired by Meteorcomm’s involvement in the railway industry, the design of the space incorporates the theme of “node and path” – the interplay of intersections and train stops – to capture this movement from place to place. Now that the final designs have come into focus, Meteorcomm is one step closer to having a space designed for their unique needs, allowing for even more innovation and growth.